Bradley Udall was my 'U' author for the Great Library Challenge, but since I've been so slack with blogging, it's been ages since I read this book so my review will be very brief and probably not very accurate. 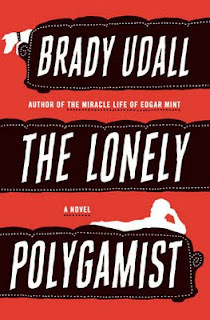 The Lonely Polygamist is about Golden Richards, a polygamist in Utah with 27 kids spread across four wives (he's made up a song to remember all their names)... but as the title suggests, he's still lonely. It's hard to imagine that someone just wakes up to find themselves the centre of a great big family, but that's almost exactly what's happened to Golden - his life is barely of his own choosing, but somehow as he's ambled along, he's managed to pick up wives and children like other people pick up stamps or rocks. Making the family seem normal is one of Udall's great achievements in this book. Although Golden is in a situation most of us would never find ourselves in, it's hard not to sympathise with him as he tackles his inner emptiness, or with his wives who want him to 'man up' and take charge instead of ducking for cover all the time, or with his kids who just want a piece of him. Their emotions and underlying tensions are the same as any dysfunctional family in any country in the world, which makes the whole polygamy thing barely even an issue, despite it being central to the novel. I guess the main point of the book is seeing Golden's character develop from a passive bystander to an active participant in the life he's created, and the ripple effect it has on the other characters of the novel. Apart from Golden's own story, we're also afforded glimpses into the lives of Trish, the neglected fourth wife, and Rusty, the most troublesome and neglected of all the kids. Like Golden, they're lonely also, and they all drift along in their own individual worlds rubbing against each other but never quite connecting. 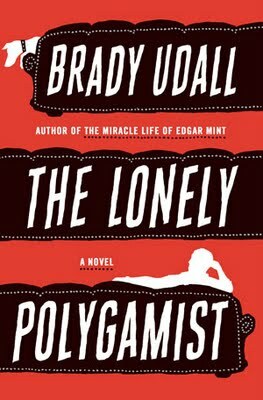 The Lonely Polygamist is a lovely book in its own way and written really well, but if I had to criticise, I'd say it was just a tad too long at over 600 pages.